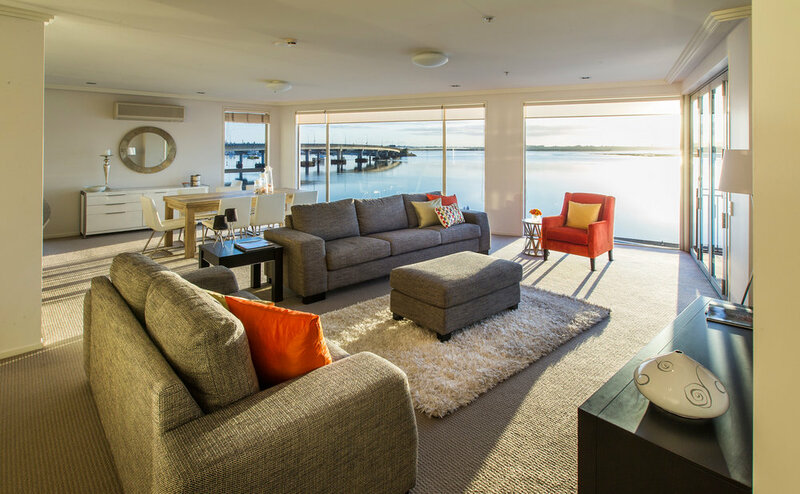 Spaciousness and captivating Tauranga harbour views are immediately apparent throughout Trinity Wharf Tauranga's newly refurbished and stylishly appointed Three Bedroom Penthouse. Offset against the cool whites, chic grey and earthy tones are bursts of fresh orange accents of colour throughout the décor creating a refreshing, yet relaxed haven. Floor to ceiling windows frame a mesmerising waterfront scene that provides an incredible ever-changing backdrop. This Tauranga three bedroom apartment style accommodation presents coastal living at it's finest. A large open plan kitchen is well equipped to ensure entertaining is a breeze. Our Executive Chef can create magic in the kitchen, showcasing his culinary skills for intimate private dinners and special occasions. Able to seat up to 12 people, the expandable dining room table also makes for an incredible boardroom meeting location or small conference venue. For business executives there is a work desk with desk lamp situated in the lounge, as well as a work desk in the master bedroom. Wi-Fi connectivity is available throughout the Penthouse. The light and airy lounge, with an expansive couch that invites you to stretch out and watch one of the many selected SKY TV channels, opens onto a large balcony set with outdoor furniture that also boasts wonderful views of the surrounding hinterland and harbour. There are water views from all three bedrooms, and also a skylight in the second bedroom. The master bedroom ensuite provides the added luxury of a spa bath and heated flooring and towel rails, in addition to a separate shower. A second bathroom offers an additional toilet and shower for added convenience. Storage is plentiful throughout this well designed apartment – making this Tauranga accommodation option well suited to long stay requirements and family holidays. * Rates are based on six adults. Accommodation images are indicative only, as views and room layouts do vary throughout the hotel. Hotel Management apply a ‘No-Party Policy’ to all hotel-rooms. Room and balcony areas are strictly non-smoking.